Looking for a better charging cable for your iPhone or Android smartphone? iSimple makes cables with rugged construction designed to withstand even the most extreme conditions. This six foot charging cable is equipped with a Lightning connector, letting you charge your iPhone on the go. You can plug it into any 12V power outlet or car cigarette lighter, and it installs in just seconds. Its black cable jacket confers a high-end look, despite its super affordable pricetag. Isimple IS9401 small but powerful USB to mini-USB charging cable is great for any compatible smartphone or tablet. Use it to connect your phone, tablet, camera, or GPS device to your home computer, charging it while syncing it with your computer’s files. With a transfer rate of up to 480 mbps, it’s fast, powerful, and easy to use. Isimple IS9405 USB to Lightning charger cable is a full six feet long, one of many improvements over the standard cable that came with your phone or iPad. With a classy black jacket and universal compatibility with aftermarket radios and iSimple Connect, it’s a great choice for charging your iPhone at home or on the go. Isimple uLinx MAX USB to micro USB cable is designed to hold up to the elements, making it a great choice for boating and other outdoor use. It’s tested for withstanding brutally hot summer temperatures over 170 degrees, as well as frigid northern winters as low as -40. Its dual layer shielding system keeps out EM and RF interference, maintaining perfect sound quality for music streaming in your car. This is the last charge/sync cable you will ever buy. 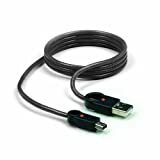 Isimple also offer our uLinxMAX cable with a Lightning connector for Apple products. The inside of your car can be surprisingly rough on charging cables, which is part of why many products wear out so quickly. uLinxMAX withstands even the harshest temperature extremes, and its heavy duty copper construction provides fast 3A charging. This is the last charge/sync cable you will ever buy.